The premium brand for fruits and vegetables deepens Asian business relations at the international fair in Hong Kong – this year, the spotlight is on cherries, citrus and grapes. 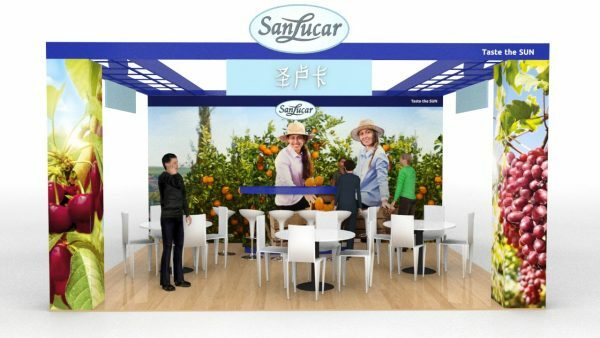 (Valencia, Spain.- 29th August 2017).- Bright red cherries, trees full of oranges and juicy grapes – wall-high images turn the exhibition stand of SanLucar into an eye-catcher. From 6th to 8th of September the premium brand for fruits and vegetables will be exhibiting at the Asia Fruit Logistica 2017, this time in Hall 5, stand 5-T31. The trade show has become an important venue for key players in the Asian fresh produce sector. SanLucar will attend for the third time in a row. „We want to deepen our business relationships in China and South East Asia and establish new contacts“, says Holger Brandt, International Business Development Director of SanLucar. The main products are cherries, citrus and grapes, cultivated and marketed by SanLucar. So far, the premium brand is available at Points of Sale in China and South East Asia. “We are in the beginning stage of our journey into the Asian market”, explains Brandt, “Step by step we have been able to get to know better and better the needs and preferences of consumers in these countries“, Cherries, citrus and grapes are especially popular, which is why SanLucar focuses its market efforts on these three products. Under the motto “Taste the SUN,” SanLucar provides 365 days of the year fruits and vegetables at their best taste. With more than 90 varieties of delicious fruits and vegetables from 35 different countries, SanLucar is the brand with the broadest range of goods in its trade. Since Stephan Rötzer founded SanLucar in Valencia in 1993, the company has grown rapidly until today, with more than 2,500 employees worldwide and with its own production in Spain, Germany, Austria, South Africa, Tunisia and Ecuador. The philosophy “Taste in harmony with people and nature” drives SanLucar’s activities – from the selection of varieties or the choice of production areas to the way the company presents its products at the point of sale.